MasterChef's Gary Mehigan believes he is fortunate to be able to do the things he loves - travel, eat, cook and talk about food. He readily admits he owes it all to his family. Most chefs recount it was the influence of a family member that first put them on their culinary path. UK-born Gary Mehigan is no exception. Food was at the heart of everything his family did and in fact, he had more than one positive role model. "Family has been crucial for me growing up and certainly falling in love with food, that is where it all started," Gary tells me when we sit down for a chat on the set of the Selector cover shoot. "Mum was a really simple cook. Nothing she ever did was extravagant or expensive, but it was always home cooked, whether it was pies and peas or a cupcake to take to school. "I remember her pulling toffee. It was a real skill and we thought mum was really clever. So we always ate very simple home cooked food, this was back in the day when people didn't walk along the streets with lattes in their hands and eating food. For us, getting take-away, which would be something like fish 'n' chips, was a bit of a rare treat. "But the real basis for why I became a chef was my grandad - he was a chef. He had a beautiful garden and he used to bake bread. It sounds a bit romantic, but I don't think it really clicked at the time. I wanted to be like my dad, be an engineer, be a fireman, a firefighter, anything but what grandad was, which was a chef. "But certainly, when I got a bit older I started to realise what grandad was doing was very tactile and very interesting and he always seemed to be having fun. Whereas my dad was always very serious - he was very calculating, a very quiet man, and I thought - I am not like my dad. I am like my grandad - happy, always chatting, engaged in something textural, so that's when I really started taking notice. "I had never been to a fancy restaurant, I had never eaten fancy food, we had never gone overseas. Our holidays were camping in Devon and Cornwall. But when grandad cooked, there was something amazing about that. It was always interesting. I loved that." It's been 12 months since his successful pop-up, Ides , became one of Melbourne's most exciting restaurants, but this Kiwi chef is out to prove there's much more to come. Shrugging off expectations can be difficult, something Peter Gunn discovered when he left Melbourne's renowned Attica to open his own restaurant, Ides, last year. "Being the ex-sous chef at Attica can be hard to shake off," he says. "Ben is my greatest mentor and has changed my life, but I don't want that restaurant. I think we're through that now, but it did take a while." Over the last two decades, Heston Blumenthal has transformed food and shown us what is possible with flavour and the total eating experience. His imagination, innovative approach and ‘Question Everything’ philosophy has changed forever the way we think about food and cooking. 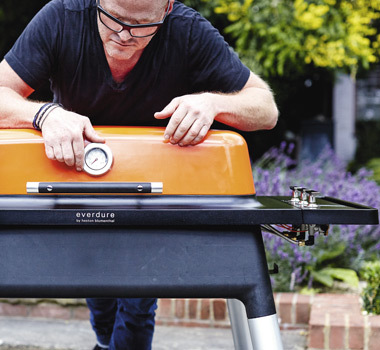 Recently, Heston turned his attention from the kitchen to the backyard and challenged the barbeque world.In collaboration with Australia’s most respected barbeque producer, Everdure, he focused his imagination and creativity on designing a stunning range of barbeques that take the primary outdoor cooking techniques of charcoal and gas and reshape them to allow the everyday cook to barbeque like never before. 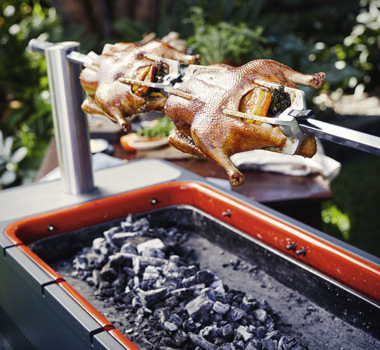 By adding electricity to charcoal preparation and supercharging gas and barbeque convection design, his rebellious nature has created two ranges of barbeques that will revolutionise what is possible in our backyards. QUESTION EVERYTHING How did this barbeque revolution happen? Well, Heston started looking at what and how we barbeque and began questioning the norms of barbeque design. “Why do they all need to basically be the same? Why does convenience have to dominate over quality?” he asked. Heston began to devise how to make them better and teamed up with Everdure. In collaboration, they came up with two amazing ranges; one based on charcoal and one based on gas. The result is Everdure by Heston Blumenthal. The charcoal range features the Hub, the Fusion and the Cube; and in gas, there is the Furnace and the Force. All have features never before seen on a barbeque with unprecedented advances in heat, control, functionality, convenience, safety and design. Being so delicate and refined, the soufflés could easily be overpowered with a wine that’s too rich. We recommend a youthful Semillon like the 2017 Synergy from Andrew Thomas Wines . It’s ripe yet so crisp, with mouth-watering acidity and the classic quinine-like layer so prized in the variety. A delicious match!